RUG LCPII .380 ACP 2.75 Inch Barrel Blue Finish Integral Sights Black Frame And Slide 6 Round. Compact design for conceal carry. Rugged construction with through-hardened steel slide and black one-piece high performance glass-filled nylon grip frame. Textured grip frame. Short, crisp, single-action trigger. Includes finger grip extension floorplate that can be added to the magazine for comfort and grip. Fixed front and rear sights are integral to the slide, while the hammer is recessed within the slide. Easy-to-rack slide designed to hold open after last round ejection. Blued, alloy steel barrel. Includes pocket holster and one 6-round magazine. Weighs just 10.6 ounces. 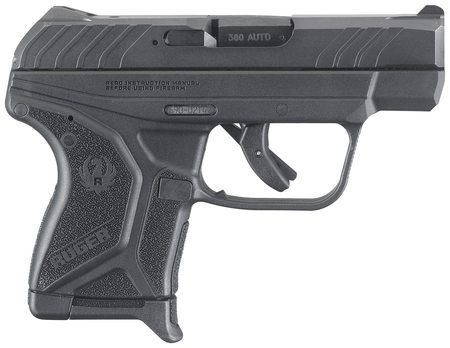 NOTE: 6-round LCP magazines are compatible with the LCPII but will not activate the last round hold-open feature. 7-round LCP magazine are NOT compatible with the LCPII.